Have you seen Avengers: Age of Ultron yet? No, nor have I, but I’m taking my young to see it this weekend. I have to admit that, despite my advancing years, I do love a good superhero movie and they don’t come any better than a Marvel Super Hero romp, now do they? So, in order that I can suitably impress my eleven year old son this weekend, here’s the latest addition to my movie trivia collection: Ten facts about Avengers: Age of Ultron that you may not have known, especially if you haven’t seen it yet!. It seems that Captain America, never actually my favourite Marvel superhero, has some upgrades made to his shield. In this, the latest installment of the Avengers movies, Captain America can now call his shield back to him if he throws it too far away. Apparently, the two straps on the back of the shield have also now been replaced by magnets that hold it to Captain America’s gauntlet. I don’t think I’m giving too much away, if I tell you that Spiderman is not in Avengers: Age of Ultron. It shouldn’t be too long, though, before we See Spidey team up with other Marvel characters now that Sony has relinquished their hold on the Spiderman franchise. In this outing with the Avengers, we also get to meet the Scarlet Witch and Quicksilver for the first time in the Marvel Movie Universe. The two are twin brother and sister and Quicksilver, no surprise here, has superhuman speed and, Scarlet With has powers such as hypnosis and telekinesis. 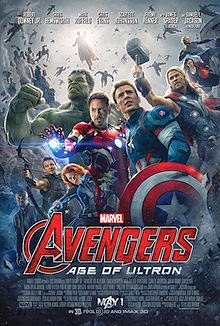 Hawkeye is another one of the Avengers team who has had a few upgrades since we last saw him. He's got a whole new set of ingenious arrows, thanks to Tony Stark, and he has a faster loading, automated quiver too. One of the great mysteries about the Hulk was always how is trousers never split in an embarrassing place. Avengers: Age of Ultron brings an end to that conundrum too, now that Hulk is kitted out with super-stretch trousers that he can wear underneath his normal Bruce Banner clothing. Captain Marvel nearly made an appearance in this outing of the Avengers, but Marvel felt that an early appearance of the flying super-heroine, before her own stand-alone movie was released, would mean introducing a new character too early. The first cut of the movie was a massive three and half hours long, that is until director Joss Whedon cut it down to two and a half. I must admit, three and half hours would have been a long time, even for the most ardent Marvel superhero fan! Age of Ultron will be like no Marvel movie you have seen before. The director, Joss Whedon, employed all the latest, state of the art, VFX and MCU and, with a budget of $250 million, that’s a lot of special effects! Watch out, too, for some amazing camera angles that were achieved by using cameras mounted on drones. Director Joss Whedon has been quoted as saying that he got some of his inspiration for the Avenger’s movie from the Godfather Part II. I’m not quite sure how that will pan out! Maybe Hulk “shows some respect”. Not that you will notice it in the movie, but Scarlett Johansson, who plays the Black Widow, was pregnant during the shooting of the movie. Most of her scenes had to be shot early in the schedule, so that her bump didn’t show and the rest were shot with a body double and a bit of clever CGI. So, there you have it, ten fun facts about Avengers: Age of Ultron and I don’t think I gave anything away in the way of big spoilers either! Hopefully I’ll get to see it this weekend, so I’ll let you know what I think. Make Mine Marvell, as they used to say!